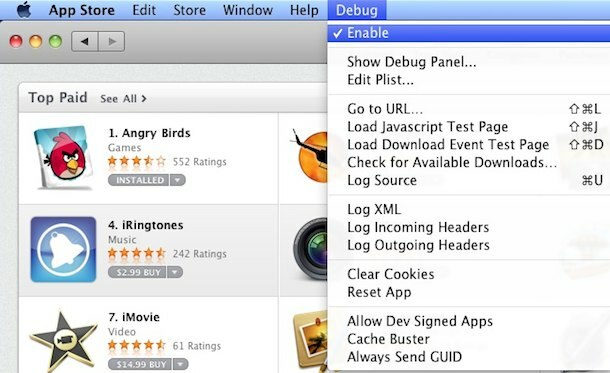 The Mac App Store includes a hidden Debug menu that can be enabled with a simple defaults write command. The menu includes a variety of interesting options and tweaks that are clearly intended for internal development purposes. 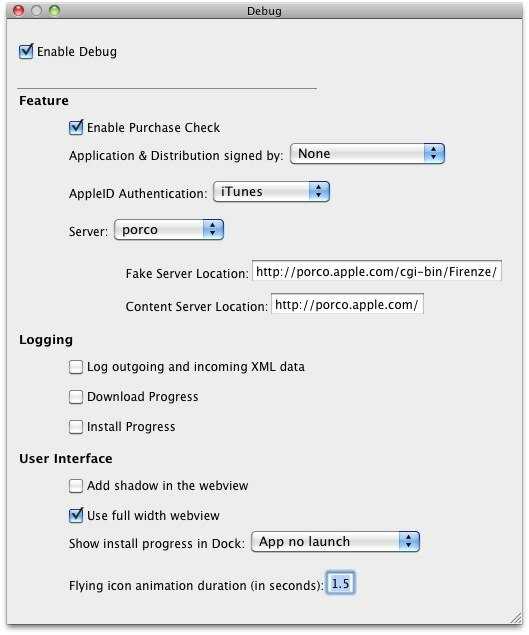 One of the more interesting parts of the Debug menu is the ‘Debug Panel’ which has various hidden preferences and features that can be enabled or disabled, including “Enable Purchase Check,” Application & Distribution signing, the ability to adjust AppleID authentication servers, the ability to ‘fake’ an Authentication Server (presumably for internal testing), download and installation logging options, and tweaks to the Mac App Store GUI (see screenshot below). Warning: Proceed at your own risk, nobody knows for sure what these hidden options do, but it’s safe to assume they are hidden for a reason. We are not responsible for you screwing up your App Store account. You’ll now find the Debug menu enabled. While this provides a fascinating look at how the Mac App Store works, we do not recommend enabling or adjusting any of the specific settings. nobody knows for sure what these options do, and you might do serious damage to your Mac or your App Store account by playing with them. But … just a look can’t hurt … can it? This echoes our sentiment on the hidden menu as well. RedSweater also suggest you enjoy the Debug menu while you can, as it is likely to be removed in the next App Store and Mac OS X software update. Anyway, have fun checking out the hidden settings but don’t do anything stupid. Cool find, I wonder if this would allow devs to test what their apps would look like in the app store and even test the download and installation process? Maybe this is for all devs and not just Apple? Nitpick: How can Red Sweater Software’s sentiment echo yours when they’re the ones who discovered the debug menu in the first place? Surely you meant to write “Our sentiment on the hidden menu echoes this as well” but your fingers slipped. The keys are, like, right next to each other. The gist and wording of the posts are identical. You getting ripped off or just writing for two sites as a ghost writer?